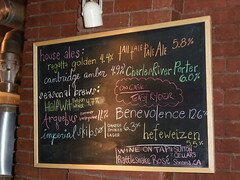 Benevolence was the star beer at Cambridge Brewing. Boston rocks. It’s a small enough city that you can see much of it by foot, yet it definitely has much more of a “big city” feel than Seattle does. When your destination is too far for a walk, then you can use their super-convenient subway/train system (The “T”). There are several neighborhoods/areas that have their own unique draw, but my favorite was the North End. It was definitely a little slice of Italy with lots of restaurants and shops that I didn’t have nearly enough time to explore. Catching a game at Fenway was everything I thought it would be. Beautiful stadium tucked into a little neighborhood with bars all around it. Fans that are intensely into the game. Just hearing the sounds of the park, with all these weird-sounding accents, was my favorite part of the experience. I even managed to find some Harpoon IPA inside the park (it wasn’t easy to find…). I’ve now been to Wrigley and Fenway within the past month; not a bad run, huh? As a Cubs fan, I’m very partial to Wrigley, but I could just as easily go the other way if I had been raised in Boston. The tall ships were in town; great excuse to walk around the waterfront. I love lobster rolls. I had never had one before. Lobster without the hassle of cracking all the shell – hell yeah. 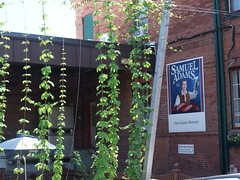 Outside the Samuel Adams brewery. Things started off at Boston Beer Works, which is right across from Fenway, before the Red Sox game. Nice spot for pre-game beers and food. Beers ranged from forgettable to solid, but nothing was truly spectacular. Their Blueberry Ale is served with a handful of blueberries floating in the glass, and it was actually much better than I expected. Great summer beer. While our hotel was actually just around the block from the Harpoonbrewery, our timing never worked out to go in for a tasting/tour. But, we did make it out to the Samuel Adams brewery. Nice tour and good to see. The Boston Lager tasted a bit hoppier fresh from the brewery..quite enjoyable. Got to try a sample of their Dry Stout, which is only available on tap at the brewery. They also have an annual contest where their brewers come up with recipes and the crowds visiting the breweries get to taste both and vote on which one they like better. We sampled an IPA and a Pils, and I surprisingly liked the Pils better (Jeanne went with the IPA). The winning beer between the 2 gets put into production for kegs/six packs. We grabbed some happy hour drinks at a place called Drink, which is a pretty classy mixing bar that excels at creating a drink fit for whatever you are looking for. They’ll guide you in the right direction for your tastes and whip up a concoction full of sweet liquor. I rarely drink hard alcohol, but this was a nice exception. One of our favorites was a Spicy Moscow Mule; I don’t remember what was in it, other than some of their homemade Ginger Beer. After a couple of drinks, I switched over to some Victory Hop Devil. I then asked the bartender what liquor drink he would make for someone who really, really likes hops; he didn’t have an answer for that one. Cool place. Cambridge Brewing Companywas the star of the trip (along with Paradiso in DC). We only had about an 45 minutes in there before we had to be somewhere else, but we managed to do tasting flight of all the beers they had on tap. The easy highlight for me was Benevolence, a 12.6% strong ale with a variety of ingredients that is aged in oak barrels then has honey, fresh dates and black cherries added. Holy crap that was good. Their Arquebus Summer Barleywine, HalfWit Belgian Wheat (4.7% ABV), Imperial Skibsol Danish Smoked Lager, and Charles River Porter were also standouts. The biggest disappointment was their Easy Rider IPA served on cask, which was absolutely bland (it was close to the end of the cask, though). Overall, fantastic beers, nice vibe, great patio. I’ll be back next time I’m in Boston. It is not a beer place, but we had dinner at a nice restaurant called Oleana in Cambridge. Interesting menu and well prepared food. They also have a beer made exclusively for them called Oleana 3c Ale from Cisco Brewing in Nantucket, MA. It was a pretty heavily spiced, medium-bodied wheat ale that would go well with a variety of food. Nice to see such a good restaurant give craft beer some focus out there. 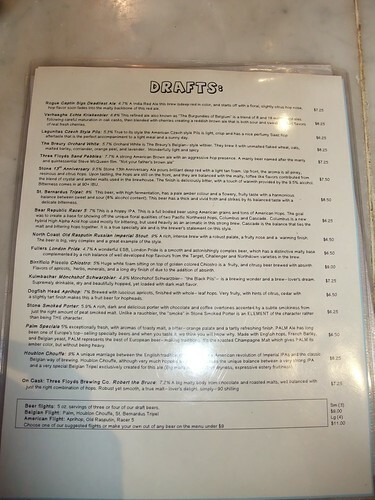 Draft menu from Pizzeria Paradiso in DC. If you’re ever in Boston again do not miss the afternoon tasting at Harpoon. It’s really fun and they give you a lot of beer samples (They pour as much as they can, no limit, for an hour). They had about 8 beers on tap when I visited in May and the tasting guide was hilarious. Fun fact: they have the first craft brewing license issued in Massachusetts, they got theirs before that “other” brewery. When in Boston for the Craft Brewers Conference back in April Jim and the great guys at Boston Brewing Co put on a fantastic spread for the conference attendees. It was a classic lobster bake for 1,800 with of course 8 beer stations with taps always flowing. The Noble Hops Pils that you mention was by far the favorite among the brewers I was hanging out with. The IPA was – well it was an East Coast IPA – well made but nothing to get aroused at – while that Noble Pils was a completely awesome beer. I hope it wins the competition and we can see it in six packs in Seattle.